The Knotted Figwort, common throughout England, is similar in general habit to the Water Figwort, but differs both in the form of its root and in having more acutely heartshaped leaves. The stem, too, is without the projections or wings at its angles, and the lobes of the calyx have only a very narrow membraneous margin. The plant, also, though found in rather moist, bushy places, either in cultivated or waste ground, and in damp woods, is not distinctly an aquatic, like the Water Figwort. 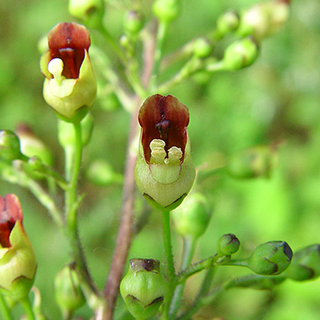 Figwort is a lymphatic stimulant and has been used for treating congestion in the lymph nodes and lymphatic cancer. The herb is also a general anti-inflammatory, having shown some promise in treating arthritis and eczema. 2-8g of the plant with 1 cup water. Take 1-2 cups per day. Figwort has a bitter taste and may be sweetened with honey. Take a tincture of 1:10 in 45% alcohol, 2-4ml at a time. Also may be used externally as a skin medication for eczema, scabies, scurf, tumors, rashes, etc. Use the leaves, crush and apply as a poultice. This is a good treatment for tenacious soars, burns, infections, and blood poisoning. 1:1 in 25% alcohol, 2-8ml. Make an infused herbal oil of the fresh leaves. This is best employed for treating swollen lymph nodes, old burns, ulcerations, wounds and abrasions. Sow the seeds during spring or autumn in a cold frame. When they are large enough to handle, prick the seedlings out into individual pots and plant them out in the summer. The whole herb is used, collected during flowering in June and July and dried. A decoction is made of it for external use and the fresh leaves are also made into an ointment.